The 2013 nonfiction book by David Finkel, follows several members of the 2-16 Infantry Battalion after they return home from Baghdad in 2008 is the basis of the directorial debut of Jason Hall who also wrote the screenplay. Hall, who wrote the screenplay for Clint Eastwood's American Sniper, explores from the soldiers perspective as try to fit into their old lives and families after everything they experienced. Many films have been made about the traumatized veterans, but this film really gets the different levels of PTSD and how the people at home react to it. 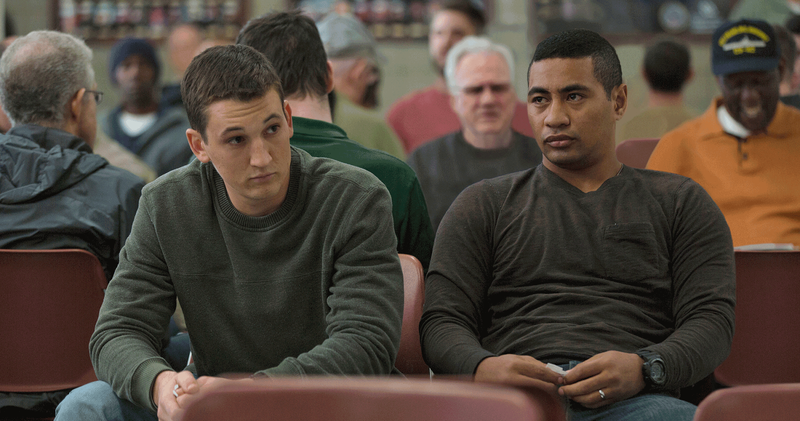 Miles Teller plays Sergeant Adam Schumann who after three tours is coming home for good to his wife Saskia (Haley Bennett) and his two small children. Adam is traveling with his two squad members, Tausolo Aieti (Beulah Koale), and Will Waller (Joe Cole). Amanda Doster (Amy Schumer) confronts Adam at the airport wanting to know how her husband James (Brad Beyer) was killed. Adam says he wasn't there, but he's clearly avoiding her question. Adam is tightly controlled. He was considered to be the best at finding at finding bombs and always rode lead shotgun on their missions. The last two events in Iraq really shook him up, but he bottles it inside, leaving him with nightmares and hallucinations. His wife sincerely tries to get him to talk about it, but he won't. Waller returns home to his fiance and child and finds his apartment is cleared out. His girlfriend won't answer her phone. The only thing he could talk about in Iraq was coming home and getting married But now she is gone without a word. When he confronts her at her work place, she refuses to talk to him about it, just saying he was gone to long. Waller's mother at Will's funeral gives Adam the name of a facility in California that treats returning soldiers for PTSD where she was going to send Will. Meanwhile "Solo", an American Samoa who says the Army saved his life, finds out he's suffering from a severe concussion syndrome that will prevent him from going back for another tour. He is having trouble remember things. On top of that his wife Alea (Keisha Castle-Hughes) is pregnant. One night while Adam and Solo go hunting, they realize that they are hanging by a thread and they need help. Adam and Solo decide to go to the Department of Veterans Affairs to finally get help. The bureaucracy of the VA is backed up for months leaving vets that are really in dire needs to their own devices. Filling out the questionnaire about their experiences terrifies them with the memories. They both start making bad decisions. Koale is a stand out as Solo. His haunted eyes reflect the tenuous hold on his reality. Teller, who has been impressing the world with roles in Whiplash and Bleed For This, does an excellent dramatic turn as Adam. You can see the torment in his eyes and just as quickly he slips into a stoic countenance. Their brotherhood had been forged in the fire of battle, the death of their friends, and the guilt that only each other can comprehend. During the Vietnam war the country was united in protesting sending their reluctant draftee young men to fight in the horrible conflict. Returning soldiers, then as in now, are faced with the misunderstanding of their family and neighbors, a mental health care system that is overwhelmed with the number of cases and no career track when they come home. This country has been in war so long, that our daily American lives seem isolated and unaffected by the sacrifices made by the men and women in our all volunteer armed services. We see a person in uniform we automatically thank them for their service. This movie shows that we have to do better by them after all they gave it all for us.